Click on the photo above for more photos. From Sunday, January 31 through Friday, February 5, Duquesne University celebrated Founders Week, an annual week-long series of events that honor the legacy, vision, and values of Duquesne's Spiritan founders. 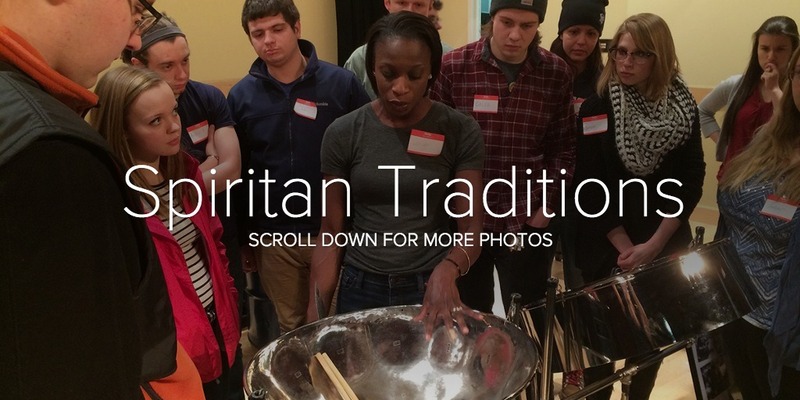 Held in early February, the event features activities focused around Spiritan education, the University's mission, and how the University community lives that mission each day. Founders Week 2016, dubbed "Live the Spirit," consisted of many campus-wide events that all served as poignant examples of that focus. In collaboration with the Division for Mission and Identity, the Mary Pappert School of Music held two events, organized by faculty members Dr. Meghan Hynson and Dr. Joe Sheehan. Together, they organized a steel pan technique workshop and world music concert. The steel pan technique workshop was held on Monday, February 1st in the PNC Recital Hall and was led by the Pittsburgh-based steel pan organization Barrels to Beethoven (Leigh Soloman, director). Over 20 people from the Duquesne campus and greater Pittsburgh area came out to learn a few hit tunes on the Caribbean steel pan. In addition, a world music concert titled "Spiritan Destinations" was held on February 3rd and featured a musical act from five countries around the world where Duquesne Spiritans can be found. The night featured a musical performance by Pittsburgh-based Brazilian Batucada group Timbeleza, an arrangement of Ghanian music by Dr. Joe Sheehan, an Indian tabla demonstration by University of Pittsburgh student Shawn Singh, a Chinese guzheng zither performance and demonstration by Duquesne ethnomusicologist Dr. Meghan Hynson, and a Caribbean Steel Pan performance by Rhythm 'n Steel. For a few short videos from this concert, please visit the Duquesne University Mission and Identity Facebook page. Fr. Raymond French, C.S.Sp., Vice President for Mission and Identity, was very happy to have collaborated with the music school, saying, "Both Dr. Hynson and Dr. Sheehan, along with all of their colleagues in the Mary Pappert School of Music, crafted excellent events that not only reflect, but enhance the already long tradition and reputation of Founders Week. Music can be such a powerful reflection of the Spiritan mission, and it is truly wonderful to have our University community come together and prove that time and time again." The Spiritan Congregation began in France in 1703. Theirs is a story that spans more than three centuries, criss-crosses continents in war-time and in peace, and features the selflessness of thousands of priests, brothers, and lay persons who have forgone society's aspirations to power, prestige, and wealth. Rather, they made and continue to make profound sacrifices to minister to the poor and disadvantaged. The Spiritan commitment to serving the disadvantaged led to the founding of Duquesne University - then a Catholic College - as a school for the immigrant poor in Pittsburgh.